Full Irish Breakfast: l’immancabile esperienza della colazione irlandese: bacon, uova, salsicce, pudding… e non solo! Full Irish Breakfast: the inevitable. 2 Full Irish Breakfast: l’immancabile esperienza della colazione irlandese: bacon, uova, salsicce, pudding… e non solo! Full Irish Breakfast: the inevitable experience of Irish breakfast: bacon, eggs, sausage, pudding... and more! 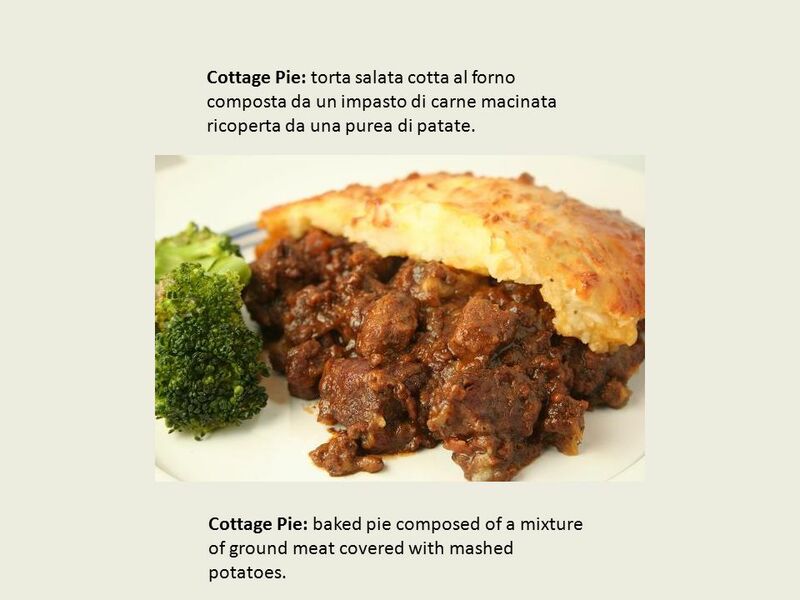 4 Cottage Pie: torta salata cotta al forno composta da un impasto di carne macinata ricoperta da una purea di patate. Cottage Pie: baked pie composed of a mixture of ground meat covered with mashed potatoes. 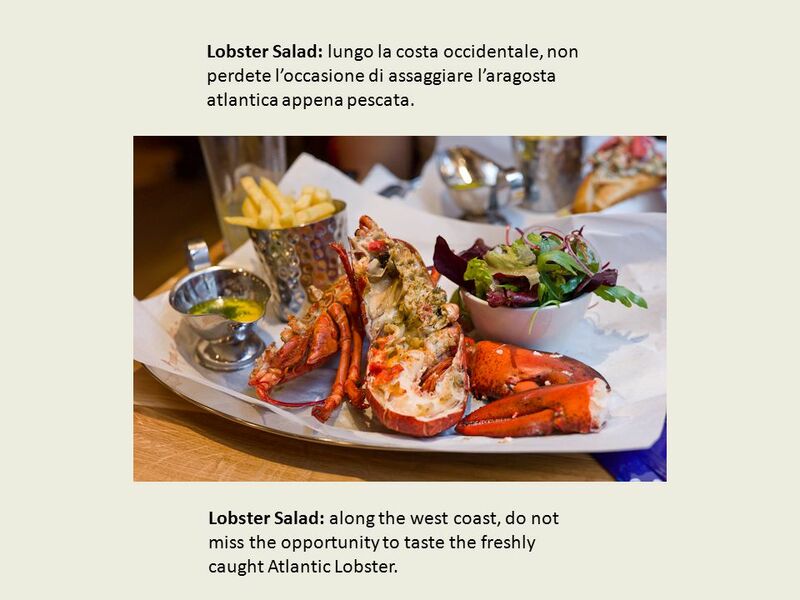 5 Lobster Salad: lungo la costa occidentale, non perdete l’occasione di assaggiare l’aragosta atlantica appena pescata. Lobster Salad: along the west coast, do not miss the opportunity to taste the freshly caught Atlantic Lobster. 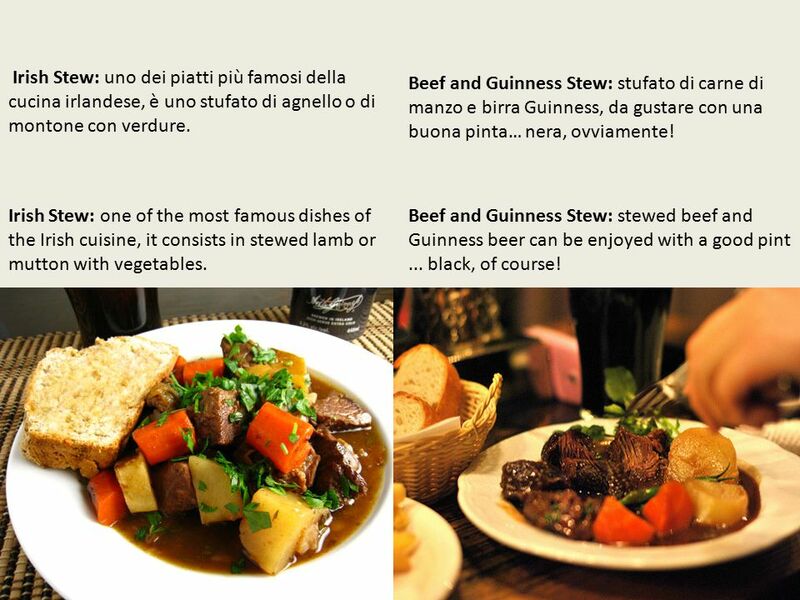 6 Beef and Guinness Stew: stufato di carne di manzo e birra Guinness, da gustare con una buona pinta… nera, ovviamente! Irish Stew: uno dei piatti più famosi della cucina irlandese, è uno stufato di agnello o di montone con verdure. 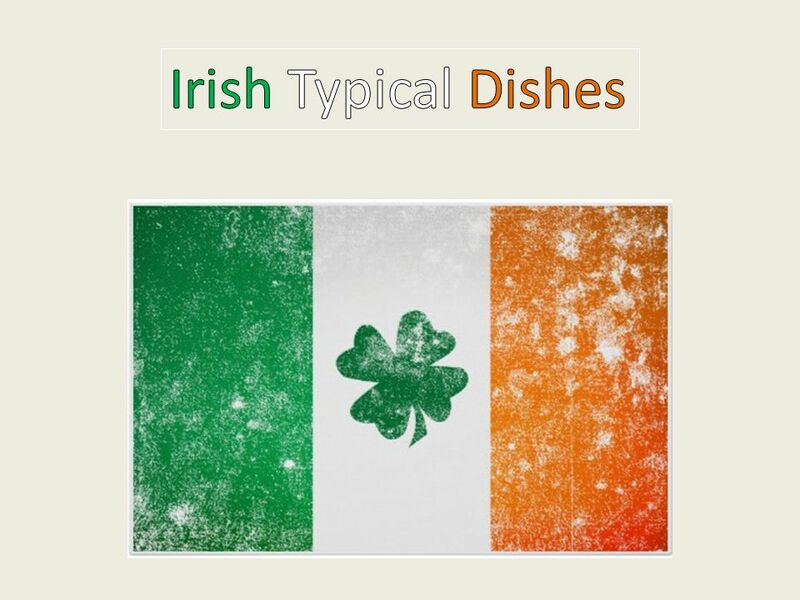 Irish Stew: one of the most famous dishes of the Irish cuisine, it consists in stewed lamb or mutton with vegetables. Beef and Guinness Stew: stewed beef and Guinness beer can be enjoyed with a good pint... black, of course! 7 Colcannon: un tipico purè di patate con foglie di verza e cipolle. 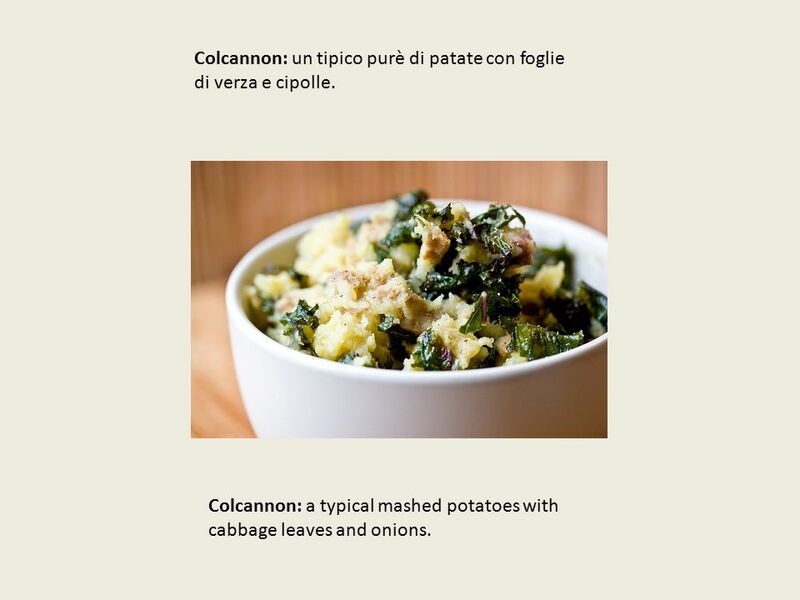 Colcannon: a typical mashed potatoes with cabbage leaves and onions. 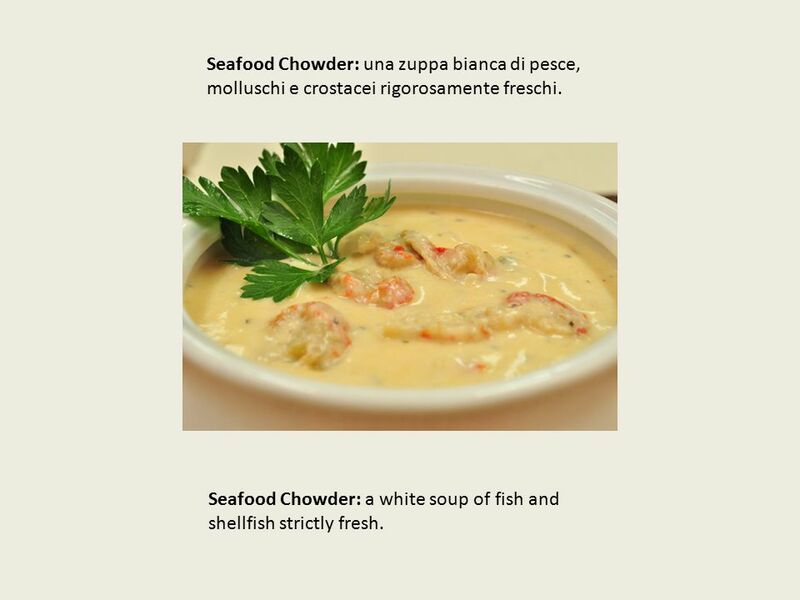 9 Seafood Chowder: una zuppa bianca di pesce, molluschi e crostacei rigorosamente freschi. Seafood Chowder: a white soup of fish and shellfish strictly fresh. 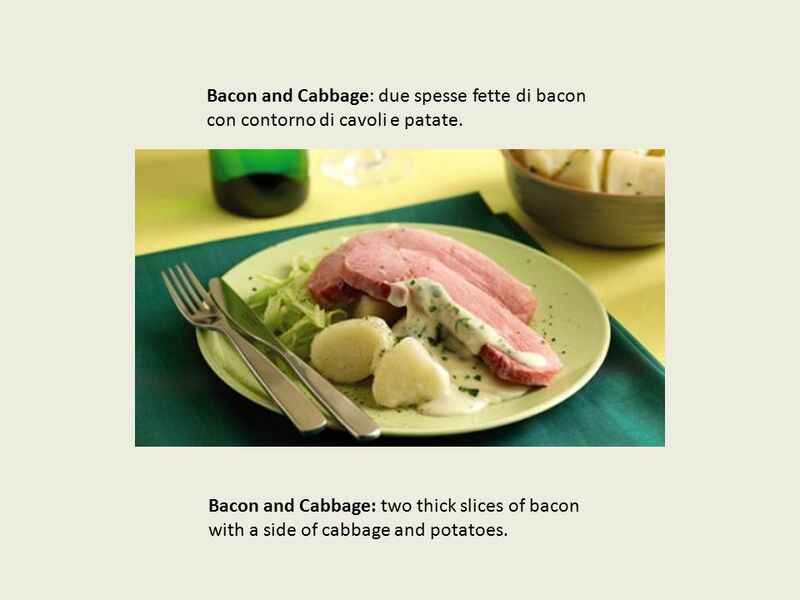 10 Bacon and Cabbage: due spesse fette di bacon con contorno di cavoli e patate. Bacon and Cabbage: two thick slices of bacon with a side of cabbage and potatoes. 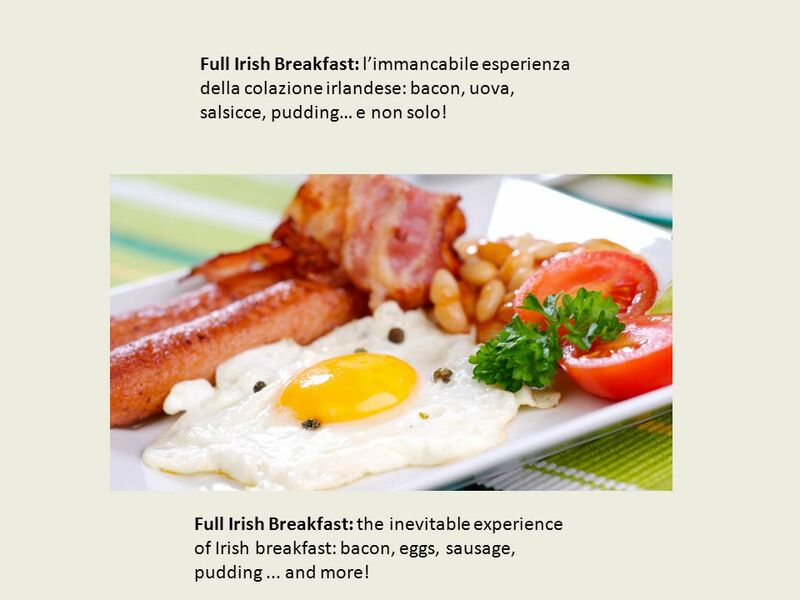 Download ppt "Full Irish Breakfast: l’immancabile esperienza della colazione irlandese: bacon, uova, salsicce, pudding… e non solo! Full Irish Breakfast: the inevitable." 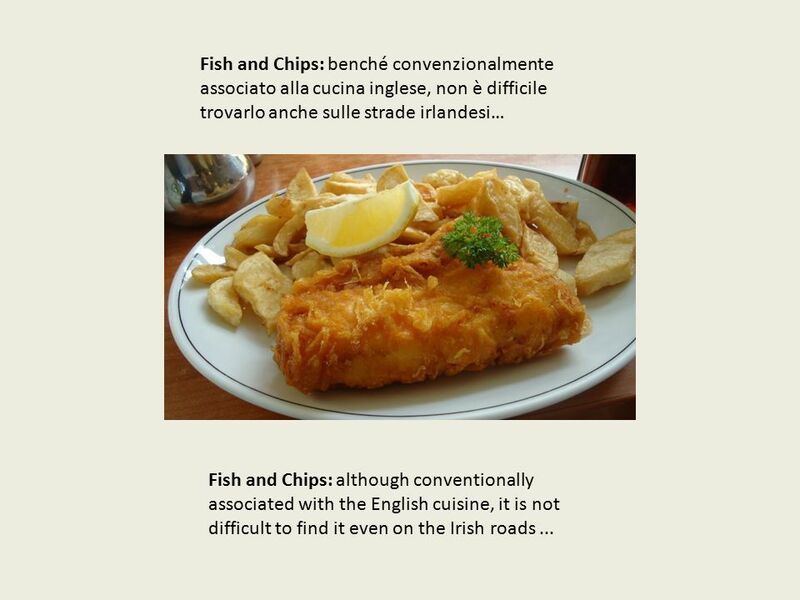 English Food. The time of food English peoples eat at differents hours: -The breakfast at 7:00 and 9:00 -The lunch at 12:00 and 1:30 p.m -The dinner at. 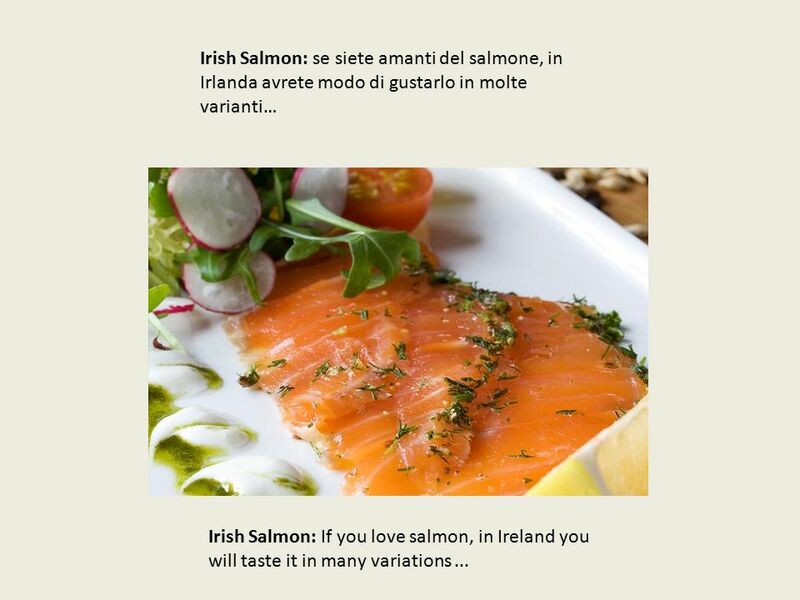 La Cucina Italiana Introduzione The Italian cuisine is divided into three parts: the North, Central and South Great regional differences Main ingredients. Soups and Sauces Foods and Nutrition. The UK traditional cooking is famous for its high quality. It has a lot of regional varieties. Most of the dishes are very popular in some regions and. Typical American, British food Sommaire : English Breakfast Christmas meal Fast Food British food by Joël Sommaire : Thanksgiving meal Christmas meal Fast. Fresh Seasonal Salad and Bread available daily. Fresh fruit available daily as an alternative to the dessert of the day. Allergy information available. S L O V A K. TRY OUR RECIPES AND ENJOY YOUR MEAL. Фурсенко Наталья Фурсенко Наталья30-Т Симферополь 2012. Richmond School 3 Choice Menu Autumn/Winter Lemon Drizzle Cake Jacket Potato Option Vegetarian Vegetables Dessert of the Day Vegetables Dessert. Northern Irish Food. Milk, Cheese and Butter The milk and butter in Northern Ireland is very different from the milk and butter here in Spain. Dale Farm. England most popular Indian dish, It is a delicious dish in which pre-marinated Pieces of chicken are grilled and then added to a thick creamy gravy. English Cousine. The Sunday roast The Sunday roast was the most popular feature of English cooking. As people had a six-day working week it was the time. CHARLOTTE LOUCA British Cuisine. CHARLOTTE LOUCA Meals and Meal Times 3 main meals a day: 1.Breakfast - between 7:00 &9:00, 2.Lunch - between 12:00 &13:30.